Coffee can be decaffeinated by various means. Existing processes employ organic solvents, or alternatively compressed carbon dioxide or hot water. In many of these processes, water is used to swell the coffee bean — which contains approximately one percent caffeine, 25 percent soluble flavor components, and 74 percent insoluble components — to better prepare it for the selective removal of caffeine. One of the more popular methods of coffee decaffeination is called the “Swiss water” process in which hot pressured water is used to extract the caffeine and some of the soluble components — the caffeine being removed from the water process stream via adsorption onto activated carbon, while the flavor components remain in the water stream to treat the next batch of coffee beans. Another popular process uses “supercritical carbon dioxide,” which is compressed carbon dioxide held at a high temperature and pressure, to extract the caffeine. The extraction for caffeine is made specific by adding moisture to the beans. 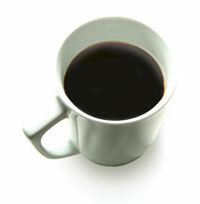 Methods which employ carbon dioxide and/or water are frequently termed “natural decaffeination” methods and offer an alternative to using toxic chemicals such as methylene chloride for caffeine extraction.&nbsp; Methylene chloride-decaffeinated coffees typically have less than 0.1 parts per million of residual methylene chloride, 100 times less than the maximum level allowed by the Food and Drug Administration. Hence, even with this organic solvent extraction process, decaffeination processors endeavor to keep residual organic solvents at very low levels. There are many variations for coffee decaffeination, but all yield a coffee that is 97 to 99.9 percent caffeine-free. The largest supercritical carbon dioxide decaffeination plant in the world is operated in Houston, Texas. These pressurized extraction methods are used by several research groups here on campus in their research efforts.